“See Her” by Ann Lewis, 2017. Photo: Ann Lewis. 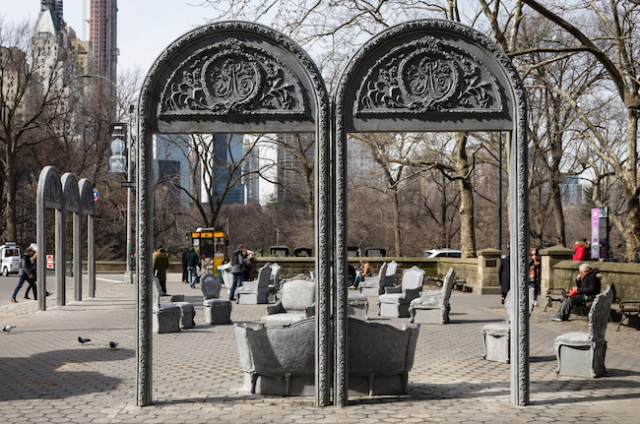 Organized for Boston by Now + There, Open House was first commissioned and originally presented in 2017 by Public Art Fund in Central Park, New York in cooperation with the artist and Paula Cooper Gallery. Photo: Liz Glynn. In-progress shot of “Patterned Behavior” by Sylvia Lopez Chavez, taken from the water, 2017. Photo: Dominic Chavez. Now + There is a bold, vital organization that sees as its mission to serve the City of Boston as a catalyst for public art, a curator that is out to challenge our city’s cultural identity by producing compelling works that take genuine artistic risks. Its projects are both temporary and site specific and are intended to acculturate Boston to the cultural, social, and economic benefits of art that reflect the diversity of its communities. Contemporary public art makes use of a range of approaches that can be mixed and matched: sculpture, found objects, conceptual art, digital art, projections, murals, interventions, performance pieces, storytelling, sound and light projects, dance and spoken word. More than serving as a symbol or a metaphor to celebrate the branded urban experience, many current public art projects are premised on social justice or environmental concerns. Now + There’s history is part of the City of Boston’s public art narrative over the last 40 years. It is the welcome reinvigoration of the UrbanArts Institute (UAI), a 501 (c) (3) non-profit organization that facilitated public art and design projects here from 1980 to 2012. Public art pioneer Pamela Worden founded the UrbanArts Institute; the program sprang from the belief that the cultural vitality of our communities depends on incorporating the arts into the public arena. In 1983, UAI secured a contract to create the Orange Line Public Art Program, an award-winning, community-based (and -involved), multi-arts project. Dedicated in 1987, the artworks that came out of this program were inspired by the experiences of those affected by the MBTA. In 1999, UrbanArts partnered with the Massachusetts College of Art and Design (MassArt). UAI director Ricardo Barreto and part-time project manager Christina Lanzl were hired to administer public art projects in and around the Boston area. This often criticized program continued through 2012: its projects included a public slide bank and engagement with communities in arts-related educational programs. Many critics felt Barreto played favorites among the artists UrbanArts commissioned. And it is true: the usual suspects constantly appeared on project finalist lists. Artist slides submitted to community panels and juries for consideration were (apparently) filtered through, and then chosen by, Barreto and Lanzl. 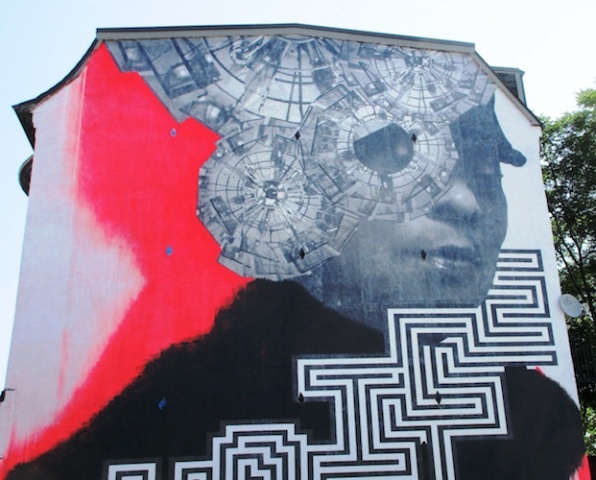 Because of this perception of an uneven playing field, a number of prominent artists refused, for several years, to participate in UrbanArts public art competitions. Also, during Barreto’s tenure Massart’s participation seemed marginal at best. In 2014, after disassociating itself with Mass College of Art and Design, UrbanArts elected Kate Gilbert to be its new director and it embarked on a bold road dedicated to curatorially-based work. Gilbert is an accomplished artist, arts educator, and curator whose career has focused on cutting-edge, temporary as well as permanent, public art projects. She has served (along with others) as a public art curator for the Rose Kennedy Greenway and the D Street ArtLab. Gilbert’s approach has enlivened Boston’s public art scene with much needed energy and concern with social issues; her approach has been refreshingly sensitive to diverse artists and the contexts of various communities. Recent Now + There projects and programs have struck out in a number of new directions. Two of the most prominent are Common Home and Accelerator Projects. This year, Now + There is unveiling eight public artworks that set out to explore a set of complex issues: collective responsibility, memory and power, leisure and consumption. Each work is about enlivening our urban environment, encouraging civic engagement, and fostering public art’s accessibility within Boston. In January 2018, Now + There was given a grant of $120,000, money which was to be awarded to the initial group of Accelerator Artists. Each artist tackles issues such as gentrification, charged with making use of music and digital art in ways that will spark appreciation and conversation about “underloved and unexpected” places. Two of the six Accelerator projects are already underway. Stephen Hamilton’s Founders Project, a multimedia installation piece, re-imagines Boston Public High School students as the legendary founders of West and West-Central African ethnic groups. Ekua Holmes’ Roxbury Sunflower project addresses cultural resiliency in the eponymous neighborhood. All six projects will be installed by October 2018. As part of 2017’s Year of the Woman program, two significant mural projects were completed: Patterned Behavior and See Her. Located on the Charles River Esplanade on the Bowker Overpass near the Mass Avenue Bridge, artist Silvia Lopez Chavez has beautified a utilitarian concrete underpass structural wall with a bright, linear, colorful mural that visually reflects the cacophony, diversity, and energy of Storrow Drive, the Charles River Esplanade, and the city of Boston. Artist Ann Lewis created See Her. Working with women in a local residential reentry facility run by Community Resources for Justice, she created a mural that expresses the realities, desires, and decisions that face women transitioning out of prison. The mural focuses on one of the facility residents, Laura — a Boston native. Her portrait is emblematic — a universal celebration of the inherent worth, strength, and potential of women. On July 26, Boston-born artist Liz Glynn will install Open House on Commonwealth Ave Mall, near Kenmore Square. The piece highlights class distinctions, past and present. The primary reference is to a Guilded Age interior made by architect Stanford White. The installations’ lavish Louis XIV sofas, chairs, and footstools evoke the historic home of the rich — but with a twist. There are sculpted additions to the objects, which are cast in concrete, a populist material more commonly used in modern architecture. Glynn addresses questions raised by a city — divided along socio-economic lines — that is bedeviled by problems of limited access. Perhaps Now + There’s most wonderful quality is its bravery, a gutsiness that drives its uncompromising selection of projects. Artistic vision comes first; the goal is to generate engaging works of art that will inspire the communities where they are placed. Now + There realizes that not everyone will like the work — yet moves full speed ahead. This article was previously published in Arts Fuse and is re-published by their permission.